We were really excited to team up with our London based friends Monument, to create a new music video for Irish guitar hero, Rory Gallagher. In 2013 Kickback City was released, a highly unusual boxed set dedicated to the blues rock icon. Inspired by Rory’s deep love of detective novels and film noir cinema, Kickback City was a 2 disc set featuring Rory’s songs most heavily influenced by the crime genre. Included in the box set was “The Lie Factory” a Novella, written by Ian Rankin and illustrated by comic book legend (and one of Rory’s lifelong heroes) Timothy Truman. We loved the idea of transforming the Lie Factory into a music video for Continental Op. Re-imagining the story in the format of a motion comic, it was a pleasure to work with Truman’s gritty illustrations. In true film-noir style, high-contrast lighting became an integral part of the visual language as half opened blinds and flickering neon create the perfect backdrop for our cast of detectives, cops and femme fatales. Incorporating lyrics as comic book narration, illustrations were reworked into pages of a virtual pulp or placed in center stage as we turned them into suspended motion snapshots. 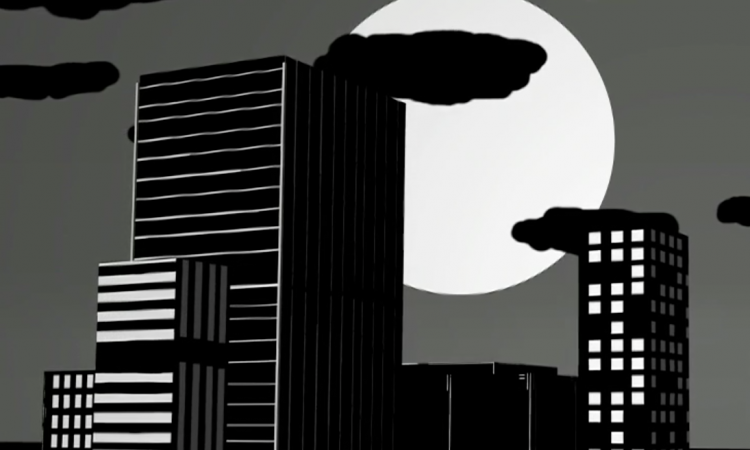 Bolstering the sections based on the Lie Factory’s illustrations, we built a brooding black and white city in 3D. Creating a vivid backdrop for our story to play out in, we take the viewer for a relentless race through Kickback City.